Both Alex Couter and I are freelance wildlife photographers living in the Boston area. We have taught wildlife photography workshops for Mass Audubon for many years. Over the last ten years I have also produced several short documentary videos, the latest of which is on shorebirds (Piping Plovers, Red Knots and Semipalmated Sandpipers). As we enter the late summer and early fall these species may be particularly hard hit by the BP oil disaster as they continue their migration south, with some ending up in Louisiana. 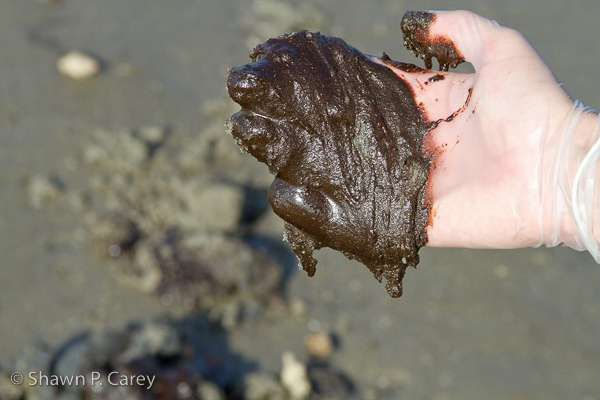 The oil on this portion of beach, about two football fields, sat there for over eight weeks! It was not visible to the public. Notice all the oil she is digging up, this went on for several minutes in just this one location. By the way, Leanne took us to see this on her day off. BP oil on Grand Isle State Park, July 29, 2010 – This shows one small spot where Leanne (above) was digging oil up for several minutes. 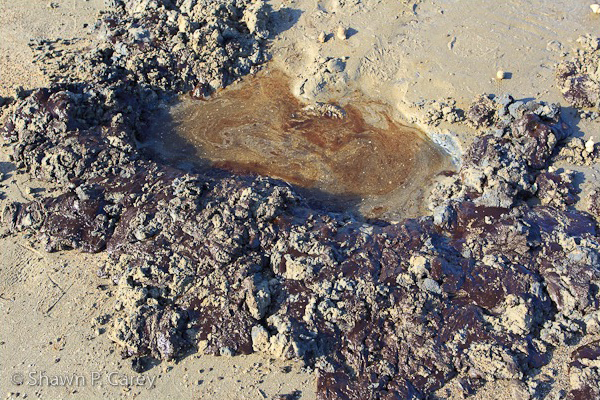 This BP oil was on this beach for over eight weeks! Two months after the BP oil disaster started, (April 20, 2010) Alex and I talked about the fact that neither of us had spoken in person with anyone that had been down to see what impact the oil disaster was really having on wildlife and the people that live with this every day. So, for a few weeks leading up to our departure, we made contacts with some people we know in Louisiana to see if we could fly down and document the disaster firsthand with photos and video. BP oil and oil soaked sand from Grand Isle State Park, July 29, 2010 – The BP oil on this portion of beach sat there for over eight weeks; it was not visible to the public. Would you let your children play on this beach? We also wanted to see what the local population thought about both the cleanup effort by BP and the response by the government. Our goal was to report back to Mass Audubon on a daily basis with a quick overview on what we found. Mass Audubon then posted to their Facebook page and Twitter all updates and photos we sent. Moving forward, I will continue to provide Mass Audubon with additional information, photos and video in an ongoing attempt to help inform those who share our concern with this situation. I will also be posting additional information to this web site so please be sure to check back for updates over the next few weeks and months ahead. 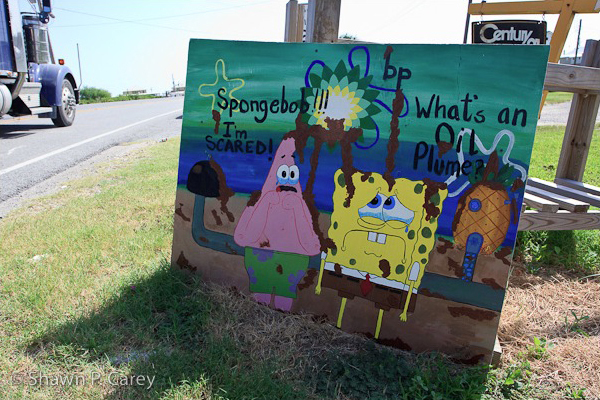 Grand Isle, Louisiana, July 2010 – One of many signs by the locals that greet you as you arrive on Grand Isle. On a very personal note, I have wanted to go to the Gulf Coast of Louisiana to photograph for many years now. Charlie Bush, a fellow wildlife photographer formerly from Massachusetts, and I would speak every so often. He has been trying to get me to join him on a photo trip to see this area for several years now. I never thought the largest oil disaster in US history would be the reason I would end up going to the Gulf coast region. I definitely left on this fact finding mission with very mixed emotions. Now that it’s over, I am glad I went. 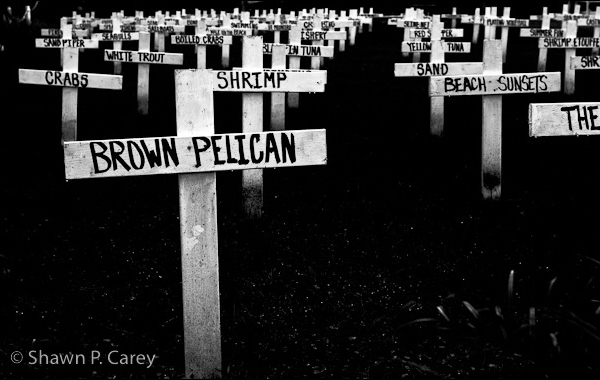 Grand Isle, Louisiana, July 2010 – Mock cemetery erected by resident Patrick Shay. I feel the information and images we obtained is material the public at large, especially the conservation community, deserves to see and hear about firsthand. I was shocked to learn and personally observe the effects and extent this oil has had on birds and other wildlife, much of which people outside the immediate area are apparently completely unaware of. Furthermore, at this very season there are huge numbers of migratory birds moving south to areas currently heavily impacted by the oil. Many of these species could soon be in serious jeopardy from the effects of the oil, not only in the coming weeks, but potentially for months and years ahead. 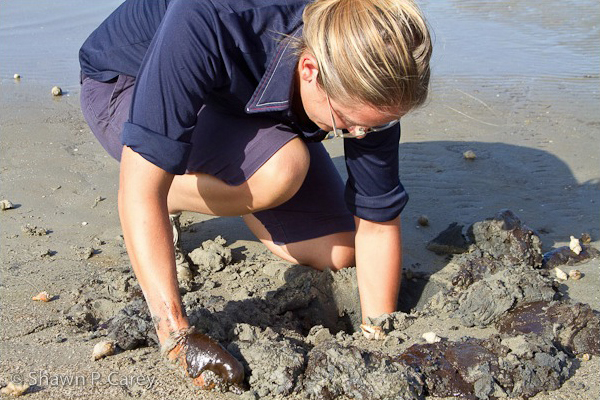 In an effort to share my findings with as many people as possible I am arranging to give presentations about the Gulf oil disaster to as many Massachusetts and New England conservation groups and natural history organizations as possible. I’m looking for any organization or media outlet to share my information with. Please contact me with any questions or to set up a date and time for a live presentation, interview or other events. Shawn’s Photos from Grand Isle Boat Trip into Barataria Bay.